Often we travel to specific places, seeking an iconic one-time experience. And if we don't find it, we leave disappointed. But for a place like New Zealand, it takes more than a single visit to gain this overall iconic experience. Even over the course of my multiple visits this year, not a single sailing in Milford Sound has been alike, and this trip, the Tasman Sea was more like Tasman lake. Life is dynamic. Things grow, move, and it takes time to really pick up on the patterns or cycles that can be summed up into a general description of a place. I am incredibly fortunate to be able to put in the time with places like New Zealand that will allow me to characterize them, to begin to understand them enough to share them. But there will always be surprises, reasons to come back for more. Last week, I found myself back there sooner than planned, and found a pattern. An unexpected encounter with a NZ Sea Lion, among the world's rarest pinnipeds. Otago Peninsula, New Zealand. In just a short time, I was reminded of what I learned on my first trip to New Zealand ... the importance of biodiversity and the collective efforts of local communities to maintaining this unique variety of living things that is so important to the health of any ecosystem. My appreciation for these things really deepened in another visit to Zealandia, where its clear the remaining native forest plants only stand a chance against introduced species with the help of their most important pollinators: native forest birds. Because most of these birds are also threatened by introduced species, to be able to fulfill this role, they rely on the human awareness that supports the conservation efforts there. Wattlebird in Zealandia, an endemic forest bird representative of the unique biodiversity that remains. Wellington, New Zealand. But the future of these & other ecosystems depends on more than on-the-ground work to conserve them. Along with my visit to Zealandia, I returned to a place that protects another special network of species in New Zealand: the South Island's Otago Peninsula. There, the staff at the Royal Albatross Center shared with me their dedication each year to the breeding success of the peninsula's most iconic species, the northern royal albatross. Sometimes this requires going so far as working with the Department of Conservation to force-feed chicks that may have lost a parent, and so are only getting half of the food they need to grow. But they also recognize that such efforts are only successful if the birds are cared for while they are out at sea, too. So, the RAC staff also devote time to educate the public about marine debris and negative fisheries interactions that could harm the birds while they are away from their breeding grounds, out of direct care. Both the success of the birds and the success of those who work directly with them depend on the species and processes that are indirectly connected. This includes the birds' food sources, as well as what is responsible for the availability of this food resource. Today, that availability can be compromised, not only by natural cycles, but also by human interaction like single-use plastic pollution, one of the biggest threats to marine biodiversity globally. Northern Royal Albatross, nesting in its place of refuge. Taiaroa Head, New Zealand. Upon my return from New Zealand, this reminder of the power of community efforts to supporting biodiversity threatened by such interactions, was reinforced by an email I received from a family of passengers I met on a cruise two years ago in the North Atlantic. Then, I was just beginning to grasp and spread the word about the issue of plastic marine debris relative to seabirds and other surface-feeding marine life. The topic apparently resonated with the family and they took it home, taking it further than I could have envisioned. The youngest of the family, Elli, is currently raising awareness about single use plastics and their potential to harm marine life through a school-wide campaign at Friends Meeting School in Ijiamsville, Maryland with a theme based on the simple Dr. Seuss truth that "everyone, no matter how small, can make a big difference" (think The Grinch Who Stole Christmas and Horton Hears A Who). The video below is a great summary of the issue she is helping to raise awareness about, and why it matters to all of us. Keep up the good work, Elli! Be it from the imagination of Dr. Seuss, on the seemingly mythical New Zealand landscape full of species found nowhere else on the planet, or within our local communities, it's evident: "We've GOT to make noises in greater amounts! So, open your mouth, lad! For every voice counts!" Inspired by facilities like Zealandia, people like the staff of the Royal Albatross Center, and communities like Elli's, let's all work together to recognize our connections to Earth's ecosystems, and realize our collective power to protect their biodiversity. Southern sea otter in his element. Morro Bay, CA. One of the most iconic destinations on the California coastline is Monterey Bay. From the historic cannery row to an internationally recognized aquarium, the bay offers a wide variety of attractions for people from all over the world. A plethora of marine life also find the area ideal to visit or live, including the southern or California sea otter. On my most recent visit to Monterey, after spending most of the morning at the aquarium, I sat down at one of my favorite places on cannery row overlooking the water to enjoy a steaming bread bowl of clam chowder. Just beyond the outdoor patio where I sat, a lone sea otter was close enough for her raw, pink nose to distinguish her as a female. Although there were no other otters nearby, she was not exactly alone. A juvenile gull was at her side, asking for food like it would of its mother. The otter was floating leisurely on her back, eating something I couldn’t quite make out from my vantage point. While she wasn't about to share any of it, she didn’t seem to be bothered by the gull either, and watching the odd couple caused me to consider their contrasting lifestyles. Getting his fill. Moss Landing, CA. Despite their differences and the otter’s apparent denial of direct interaction, as a part of the same ecosystem, they’re still linked. At the ecosystem level, a species’ niche is essentially their role in that system, defined by their habitat needs, and the way in which they fulfill those needs. For a few species, this role is more significant than others' in the system (i.e. their impact on the ecosystem is greater than that of the size of the animal itself and/or of its population in the system). These species are called keystone species, and sea otters are one of the most well understood examples. Sea otters consume about one third of their body weight daily, an appetite that is satiated by a wide range of predominantly marine invertebrates found among the subtidal zones within their home ranges. Much of the areas where otters forage are dominated by large brown algae species, commonly known as kelp. Kelp are anchored to the sea floor by a root-ball-esque ‘holdfast’, from which they grow quickly up to sea surface where their broad blades can absorb sunlight and photosynthesize. In areas where multiple kelp organisms are growing in water depth of 15-100 feet, they essentially create an underwater forest. Life in the underwater forest canopy. Monterey, CA. Just like forests on land, these kelp forests are complete with a canopy and an understory that create the structural complexity within which many marine organisms find food and shelter. It's in the understory where sea otters forage. One of the most important prey items for the southern sea otter are purple sea urchins. Sea urchins in California kelp forests normally feed on 'drift kelp' or pieces of the large kelp blades that break off and decompose over time, like leaf litter in a terrestrial forest. The urchins trap the drift kelp in their spines as it settles toward the sea floor. But if there are too many urchins in a given kelp forest, there won't be enough drift kelp to go around, and the hungry urchins will begin to use their scraping jaws to eat away at the holdfasts that are rooting the live kelp to the sea floor. Without their holdfasts to anchor them, the kelp will be carried away by tidal currents or wind-generated surface turbulence. No kelp, no kelp forest habitat, and the organisms that are both directly and indirectly connected to it are affected. This includes the gulls that naturally rely on productivity in the subtidal zone to supply the shoreline and sea surface with scavenging opportunities. 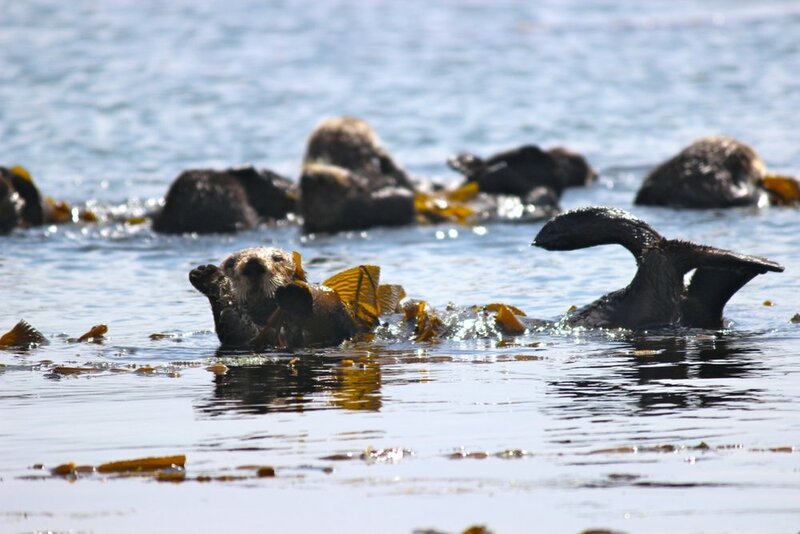 By keeping the urchin populations in check, sea otter foraging reduces the vulnerability of kelp forests to direct urchin predation, thus contributing to the overall integrity of the habitat for all of the organisms that live in it and interact with it. Purple sea urchins in the kelp understory. Monterey, CA. I looked away from the otter and the gull, at my own meal of shellfish and thought of myself as part of the ecosystem. Many humans are more like the gulls, living in circumstances that necessitate opportunistic living. But some of us have options. Today, there are many opportunity for us to be keystone individuals within our communities, where the significance of our role is greater than we may currently realize. As keystones, we can work together to make significant lifestyle choices that help to maintain balance within the ecosystems to which we are connected. Sometimes, this will demand creativity, but like the otters, we can use tools to tackle the more challenging opportunities for sustainability. Pondering the sea otter niche over a meal reminded me of one tool that is well worth sharing. Many of the choices we are faced with every single day concern food. Thanks to the Monterey Bay Aquarium and their Seafood Watch Program, sustainable seafood choices are one of the easiest ways we can start. Download your free regional seafood pocket guide or the sustainable seafood app by clicking on the highlighted link above, but don't stop there! Even when our human lifestyles seem as different as that of a seagull and an otter, a dependence on a balanced earth for survival is something we’ll always have in common, and the effort will be well worth the reward. So, for those of us who have the choice and can access the enabling tools, let's be the sea otters of humanity and live as keystone individuals of balanced communities, ecosystems, and the earth. Teaching the next generation. Morro Bay, CA. On the rim of the "funnel" in 2014. Mt. Juneau, Alaska. Well, my boots were waterproof. On a day like this, an appreciation for the term ‘temperate rainforest’ is eclipsed by the threat of getting flushed out by it, as if the landscape itself is ready for the summer season of tourists to be over. Here in Juneau, Alaska, coastal precipitation is essentially funneled by the steep mountains that surround it, providing the ideal conditions for water to revert the manicured trails back to their wild state. Needless to say, my hiking plans were thwarted. So, while the wilderness reclaims itself, I’m finally sitting down to write this blog post that’s been rolling around in my brain for the past two months. I’d say the beginning of my ‘getting to know’ this landscape was when we left Oregon at the beginning of August, heading for British Columbia’s coast mountains. For mountain bikers, hikers, and kayakers alike, the entire Pacific Northwest is a giant playground. And I was almost too busy ‘playing’ to notice the circumstances that often provide for this recreational haven. An article published in the most recent Tongass National Forest Visitor Guide I stumbled across put it this way: “Recreation requires a specific set of overlapping resources.” For example, most of the amazing mountain bike trails we've been exploring have been built within second-growth actively logged forests. I was alluding to this paradox in a recent Instagram post after a challenging bike ride in the Caren Range of BC’s Sunshine Coast, where logged patches of land stand out among scattered tracts of some of the last remaining old growth forests in the area. The terrain is rugged, foreboding, and the challenge of even just pedaling over the logging roads gave me an amazing appreciation for the energy it took to create them in the first place (especially before modern logging practices). The view from the top was stunning, and the opportunity to experience it was possible because we had access to it, access that was provided by the extraction of timber resources. The Pacific Northwest is full of opportunities for outdoor recreation. Desolation Sound, BC. In the United States Wilderness Act of 1964, wilderness is "recognized as an area where the earth and its community of life are untrammeled by man, where man himself is a visitor who does not remain.” Biking in BC, I’d found myself wondering how to argue for the designation and preservation of wilderness areas for humanity’s sake. Beyond aesthetics, these areas contain resources that could be used, while still providing recreational opportunity. Fast-forward a few weeks and I'm on the bridge of the Celebrity Infinity, providing commentary as we approach the 400-foot frozen face of the Hubbard Glacier for the last time of the ship's Southeast Alaska sailing season. During a pause in my narration, the friendly pilot onboard shared with me his appreciation for Alaska, a place where he was often in the presence of things bigger and more powerful than himself. Just a few moments later, I was back on the microphone, excitedly announcing the dramatic calving of enough ice from the face at once, that water was thrown into the air higher than the glacier itself followed by a wave we could feel roll under the ship (even after the wave had traveled the one mile distance between us and Hubbard). It was in that moment, as an honored visitor witnessing the power of glacial forces, when I realized the importance of wilderness itself as being among those 'overlapping resources' required to recreate. We need resources not just to provide the opportunity to explore outdoors, but to humble us too. Today in Juneau, I was humbled in a different way ... a less welcome visitor this time, but still in the presence of something greater (and more persistent) than myself. Face to face with Hubbard Glacier. Yakutat Bay, Alaska. Recreation has become a means by which we connect with the planet we live on and all of the natural resources it contains. Why do so many of us need to recreate to connect? Maybe it's because we have few other direct connections to them. In most of the western world, we are relatively disconnected with the resources that support our lifestyles. Whether it's through mountain biking, scenic cruising, or something in between, getting outside to enjoy the environments from which these resources are sourced (pun intended) reconnects us to them. But no matter how we choose to recreate, the connections are what we make of them. Being conscious of the overlapping resources necessary to support these activities is the first step, but that awareness should also include reflecting on the value of these recreational opportunities in our lives. By learning from these experiences, we can then support efforts to conserve the resources that make them possible, so that future generations can also fulfill their resource needs. There are many different ways to recreate, each requiring its own unique set of 'overlapping resources.' How we make that recreation sustainable is up to us. Little more than a week since we left the island, and the scent of fennel with a hint of sage is still fresh on my mind (and probably still coming off of my clothes). After this trip in particular, I have been pondering what exactly is so special about it … Not just for me, though it has significantly influenced my life, but for everyone who has the opportunity to participate. The scenery is beautiful, no doubt, and the friendships that develop or deepen over the shared task of maneuvering through dense brush to survey the island’s plant communities are both important highlights of the program. But more than the people and the setting, what makes the experience a lasting memory is the exposure to a world of opportunity beyond what can be found in a conventional classroom. Field biology with a view. Above Prisoners Harbor, Santa Cruz Island, CA. Just before I joined this year’s trip as a chaperone, I had been to the Mountain Film Festival in Telluride, Colorado. One of the features that stuck with me was E.O. Wilson: Of Ants and Men, based on the man behind the revolutionary field of Sociobiology that would change our modern understanding of science. When interviewed in the film, the now 87-year-old scientist and author credited key moments from his childhood for inspiring the curiosity that would later develop into his successful career. That’s when I realized, I could relate. Pondering my place in 2007. Fraser Point, Santa Cruz Island, CA. Wilson describes a key moment as a young boy, watching a jelly, fascinated by the mystery of the animal and wanting to know more. The story reminded me of a day on my first trip to Santa Cruz Island in 2007. One of my favorite parts of the class was studying the entire island ecosystem, beyond the vegetation we were actively monitoring. So, after a morning of plant surveys, we went out to Fraser Point (the extreme west end of the island) for the afternoon, and came upon a cove that was littered with dying Humboldt squid. I clambered down to the shore to get a closer look. I’d never seen such an animal with my own eyes, and I was in awe of how beautiful they were, rapidly changing colors in a way that made them look distressed. I wanted to help them back to the open sea where I felt they belonged, but as I watched a few that were still in deeper water where an escape was possible, I realized my efforts would be in vain. They didn’t need saving. The result of management decisions, the endemic Santa Cruz Island fox stands out amongst introduced flora. Christy Ranch, Santa Cruz Island, CA. I was conflicted then, not just about whether or not to help the squid, but about everything we were doing there on the island, working to restore the ecosystem damaged by over fifty years of introduced animal habitation gone unchecked. I would realize by the end of the week that we have to learn about the natural history of an environment to understand our place in it. As adults in today’s world, we are often in a place where we must decide where to draw the line between what is ethical, environmentally responsible, or even what is our role in the management of resources. It is important that we are equipped to make informed decisions. 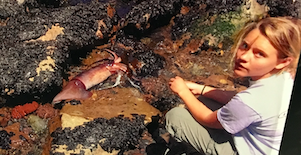 The squid were there to die, responding to a natural change in their underwater ecosystem. The wildlife on Santa Cruz Island, however, as I would learn throughout the course, were not prepared to have their survival compromised by introduced animals or to be outcompeted by introduced plants. The Santa Cruz Island Field Biology program was established so that students could be introduced to and be a part of the real world challenge of finding balance between meeting the needs of people and other living things that call a place home. In that moment on Fraser Point in 2007, the floodgates of inquiry opened in my mind, and I haven’t stopped wondering about the world around me and where I fit into it since. A taste of field science. West side, Santa Cruz Island, CA. Although I haven’t left a legacy that measures anywhere close to that of E.O. Wilson, my short career to date as a Marine Biologist and Naturalist has allowed me to communicate the importance of observing and understanding the environment around us to thousands of adults and children. When I speak to an audience on a cruise ship, I am often asked what career advice I’d give to students. I love to share my experience on Santa Cruz Island, stressing the importance of volunteer field work and taking advantage of opportunities to learn outside! I attribute much of my own career direction to the exposure I found while on Santa Cruz Island. The field of island biogeography embodies another connection between E.O. Wilson and my first experience on Santa Cruz Island. Wilson's theories have been critical to understanding the natural history of island groups like the Channel Islands and the very subject would be my research topic to present to the class at the end of the week. Since that trip, I guess I’ve been studying island biogeography ever since … Hawaii, French Polynesia, Australia, New Zealand ... where I have worked to convey the unique nature of these places, and am always fascinated to learn more about the driving forces behind these characteristics. Working to understand the balance. Trail to Pelican Bay, Santa Cruz Island, CA. My point is that the trip was incredibly valuable to me as a student nearly ten years ago, and continually proves it’s worth as my career develops. This year, it was wonderfully fulfilling to watch an entire group of students also appreciate the value of the experience, fully embracing every challenge and chance to realize their growing edge as young adults. E.O. Wilson said, “Nature is where we belong.” Many of those kids said throughout the course of the week that they felt like they belonged there. I knew the feeling then, and know it now. Smiles say it all. El Diablo Peak, Santa Cruz Island, CA. As we left the island with a dramatic send off from a pod of close to a thousand common dolphins, an unforgettable experience similar to that of my first time leaving in 2007, I was overwhelmed with gratitude for every person who has made this program possible, and was so honored to be a part of its ongoing success in positively influencing the lives of PRHS students this year! Whenever you get the chance, encourage and facilitate opportunities for young people to get out and be inspired by such experiences. They may be among those that influence them for the rest of their lives. Common dolphin send off. Santa Barbara Channel, CA. A "habitat" is defined as an animal's home, a place where it can have access to food, water, shelter, and space. But for the more complex animal species, where they call home is more than a habitat. Humans, whales and even domestic dogs need to live in a place where they feel comfortable and can engage in social behaviors. I've been pondering the concept of 'home' a lot lately, as many people who travel frequently do. Maybe it's partly because I spent the first four months of 2016 calling a cruise ship 'home', and am now living out of a big red Sprinter, affectionately called "the nevervan." But I know it's also because I've been thinking about whales. Humpback mother and calf meeting their needs in their winter waters of choice. Lanai, Hawaii. Where do whales "live?" The habitats of migratory animal species, like humpback whales, are characterized by what is called a "home range." This is an area over which they move throughout the year to fulfill their habitat needs and more. Within this home range are specific places where the migrants spend significant time, and/or carry out distinct behaviors. Humpback whales move between places where the resources they need to survive are guaranteed. Hawaiian waters provide warmth and refuge, ideal conditions for the basic animal need to reproduce and invest in the next generation. For conservation purposes, these areas within their home range are important. Through their protection and efforts to conserve their known feeding and breeding areas, the population of North Pacific humpback whales has rebounded to over 10,000 individuals, from less than 1,000 just 60 years ago. Even a few days in Hawaii, catching the very tail end of the the North Pacific humpback whale breeding season were enough to remind me that it will always be a personal home away from home. What drives some humans to wander to meet their needs, and others to be perfectly satisfied in one place? Those of us who consider ourselves wanderers recognize that, similar to migratory animals, not all of our needs can be fulfilled in one place at any given time. Some argue that this wanderlust is genetic. For me, Hawaiian waters are a reminder of my first experience on a coral reef, which inspired a career of conservation education. And to continue this effort, I can't spend all my time in Hawaii, I have to move on. The whales and I have other needs, and for the most part, we know exactly where to go to meet them. The majority of the North Pacific humpback whale population have migrated to Alaska for the summer, where there will be abundant food in the form of swarms of krill and oily fish. I'm on my way to Alaska too, not for food specifically, but for a purpose. So we seek our fills in sequence, moving between these places, sometimes even opportunistically 'feeding' as we go. This year, some of the whales made a pit stop in San Francisco Bay, eating and stirring up media attention. And after my time in Hawaii, I paid a visit to the North Cascade Mountians of Washington, far from the ocean, but surrounded by water that appropriately cascades out of every crack and crevice. Freshwater opportunity. North Bend, Washington. From Washington, I made a short trip to the beautiful mountain town of Telluride, Colorado for the 2016 Mountain Film Festival. In just a few days there, I was inspired by so many incredible stories, and the people who told them so powerfully. The team behind Elk River particularly struck me with their film that captured for the first time on camera the migration of one group of elk that spends half of their lives in Yellowstone National Park. The narrator of the film concludes that "migrations are what make [these] animals wild", able to move outside of the imaginary lines that define the park, driven and guided by a complex of instincts and cues we have yet to understand for any migratory species, including whales. It made me wonder if moving, following that (possibly genetic) propensity to wander, makes myself and others like me 'wild' in a human sense. There's great freedom in just the ability to move, whether or not its necessary. I am lucky to have the opportunity as a human to wander, to move freely beyond, erase, and redraw the lines of what previously defined the boundaries of my home range. Although not all humans and other animals need to wander or migrate, the wildness of even these non-migratory or "resident" animal populations is being compromised in many places by fragmented habitats, which removes their ability to shift their home range if they need to. Many humans in the world have also had this option taken from them, both realities I have been reminded of by other films shown at the festival. Resident Spinner dolphins. Big Island, Hawaii. Maybe at some point, the necessity to move or migrate will pass, and us wanderers will settle. Some members of historically migratory whale populations stop migrating when the population is large enough to warrant non-reproductive individuals from moving. Maybe that's why Hawaii's whale counts this year were lower than in previous years. Beyond El Niño oceanic conditions delaying their arrival to their wintering grounds, it seems that many just simply didn't show up. Although there is much yet to be understood about why, we can wonder if perhaps they didn't need to. For now, the whales remain wild, and I will continue to wander, following both necessity and opportunity to learn more about our habitat needs and to define what it means to be home.